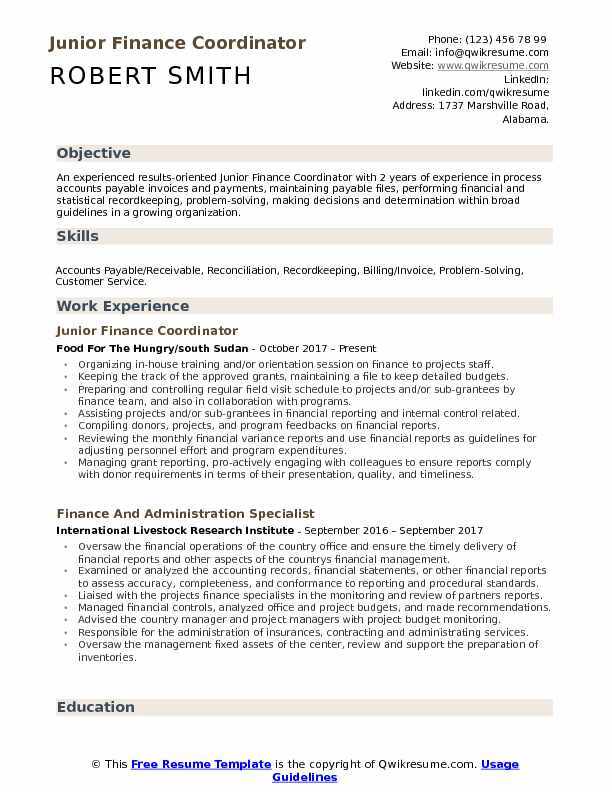 The Finance Coordinator is responsible for job tasks, like computerizing, classifying, recording, and verifying financial data and records of an organization. Some of the other important job duties that can be commonly seen on a Finance Coordinator Resume are: to sort documents, to compile records, to check invoices and bills, to perform substantial business transactions, and to coordinate the various financial activities of the company. To embark on this challenging career, you need to have certain important and mandatory qualifications and characteristics, like strong analytical skills, excellent mathematical and financial knowledge, and an urge to be up to date about latest trends. The minimum education required to apply for this role is a Bachelor’s Degree in domains like Finance. Special preference will be given to people with relevant work experience, Master’s Degree or Specialization in the relevant field, and/or renowned certification in the pertinent domain. 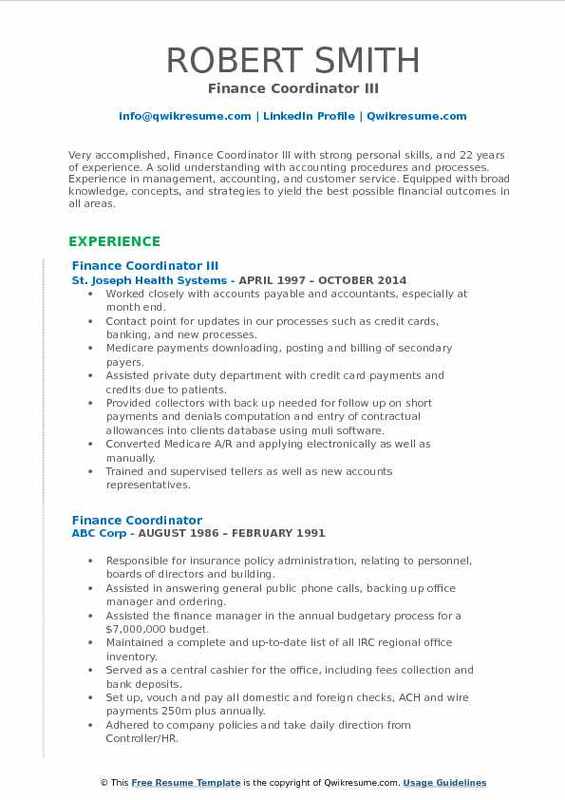 Objective : An experienced results-oriented Junior Finance Coordinator with 2 years of experience in process accounts payable invoices and payments, maintaining payable files, performing financial and statistical recordkeeping, problem-solving, making decisions and determination within broad guidelines in a growing organization. 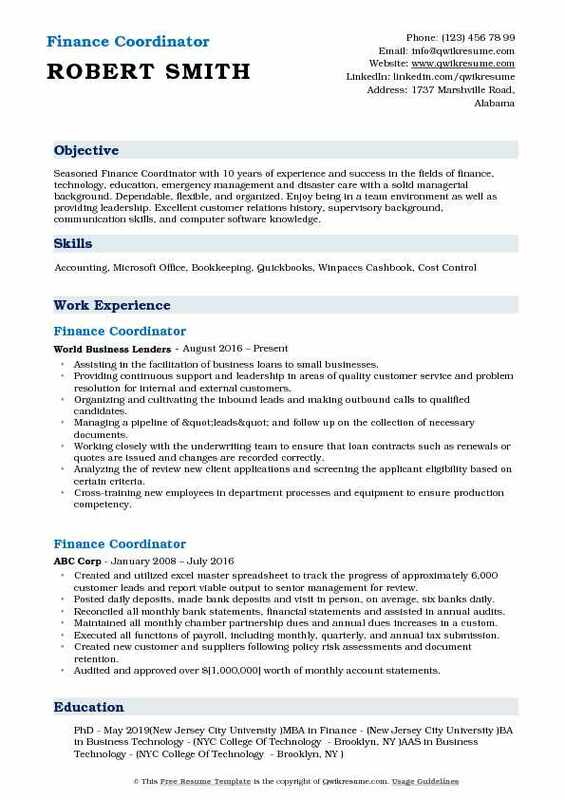 Skills : Accounts Payable/Receivable, Reconciliation, Recordkeeping, Billing/Invoice, Problem-Solving, Customer Service. Organizing in-house training and/or orientation session on finance to projects staff. Keeping the track of the approved grants, maintaining a file to keep detailed budgets. Preparing and controlling regular field visit schedule to projects and/or sub-grantees by finance team, and also in collaboration with programs. Assisting projects and/or sub-grantees in financial reporting and internal control related. Compiling donors, projects, and program feedbacks on financial reports. Reviewing the monthly financial variance reports and use financial reports as guidelines for adjusting personnel effort and program expenditures. Managing grant reporting, pro-actively engaging with colleagues to ensure reports comply with donor requirements in terms of their presentation, quality, and timeliness. Assisting and/or advising projects and program departments on their respective budget. Conducting monthly account allocation of balance sheet accounts in the Sun systems. Responsible for timely, accurate, and efficient financial reporting (both electronic and manual field returns) to the head office. Responsible for ensuring that reconciliation of balance sheet/control accounts is carried. 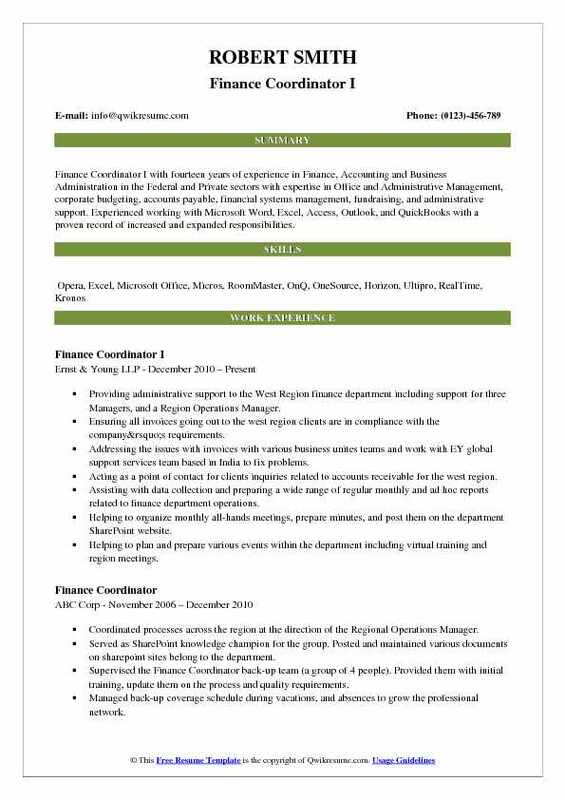 Objective : Finance Coordinator with 4 years of expeirnece providing administrative support to management through reconciliation of money and all applicable paperwork, including private information and money equivalents. Delivering an unparalleled customer experience through the best combination of knowledge, patience and team work to foster and promote a cooperative and harmonious working climate that is conducive to maximum team member morale, productivity and efficiency/effectiveness. Responsible for balancing cash, checks and credit cards securing transaction practices with safe money handling procedures. Disbursing thousands of invoices, purchase orders and reports for processing and assist employees with technology and process automation to propel efficiency and significant time and cost savings. Prepare month-end journal entries and reconciliations. Managed up to 600 invoices ($10m) per month. Created over 300 monthly service entries ($3m) on established orders. Served as a proxy for the processing of hundreds of expenses, troubleshooting and investigating the status of reimbursements. Conducted audits of electronically uploaded invoices for accuracy, approval and/or deletion. Initiating void/stop payments, reissuing of checks and resolving payment issues, ensuring positive vendor/supplier relationships. Performing accounting operations by filing documents, reconciling statements, running software programs. Accurately processing payments and documents such as invoices, journal vouchers, reimbursements, and statements. 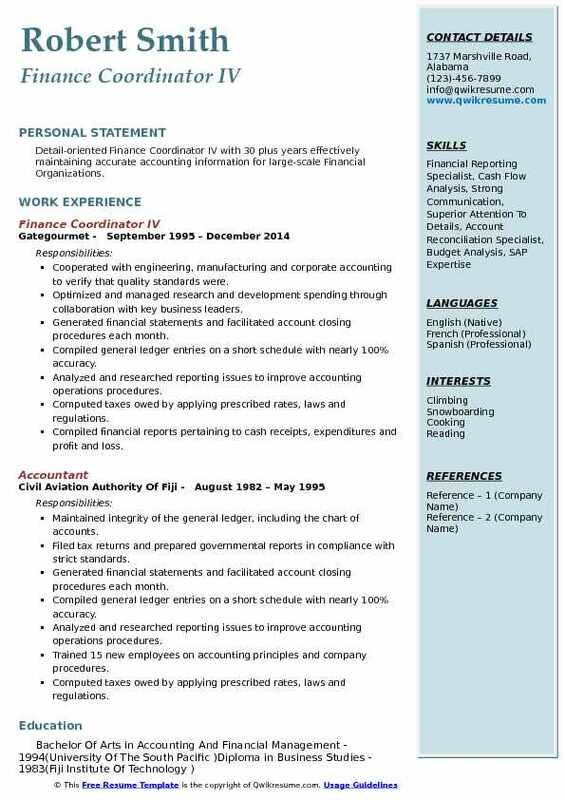 Summary : Finance Coordinator I with fourteen years of experience in Finance, Accounting and Business Administration in the Federal and Private sectors with expertise in Office and Administrative Management, corporate budgeting, accounts payable, financial systems management, fundraising, and administrative support. Experienced working with Microsoft Word, Excel, Access, Outlook, and QuickBooks with a proven record of increased and expanded responsibilities. Providing administrative support to the West Region finance department including support for three Managers, and a Region Operations Manager. Ensuring all invoices going out to the west region clients are in compliance with the company’s requirements. Addressing the issues with invoices with various business unites teams and work with EY global support services team based in India to fix problems. Acting as a point of contact for clients inquiries related to accounts receivable for the west region. Assisting with data collection and preparing a wide range of regular monthly and ad hoc reports related to finance department operations. Helping to organize monthly all-hands meetings, prepare minutes, and post them on the department SharePoint website. Helping to plan and prepare various events within the department including virtual training and region meetings. Researching and managing the travel arrangements including lodging, airfares, and local transportation when needed. Participating in special projects and initiatives related to improving finance workflow. 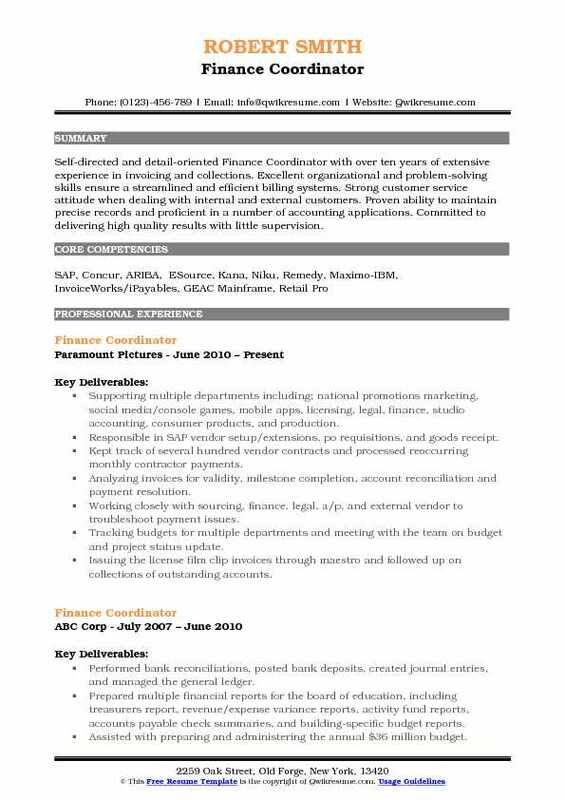 Summary : Very accomplished, Finance Coordinator III with strong personal skills, and 22 years of experience. A solid understanding with accounting procedures and processes. Experience in management, accounting, and customer service. Equipped with broad knowledge, concepts, and strategies to yield the best possible financial outcomes in all areas. Worked closely with accounts payable and accountants, especially at month end. Contact point for updates in our processes such as credit cards, banking, and new processes. Medicare payments downloading, posting and billing of secondary payers. Assisted private duty department with credit card payments and credits due to patients. Provided collectors with back up needed for follow up on short payments and denials computation and entry of contractual allowances into clients database using muli software. Converted Medicare A/R and applying electronically as well as manually. Trained and supervised tellers as well as new accounts representatives. Maintained contract database, responsible for financial termination processing of delinquent. Summary : Detail-oriented Finance Coordinator IV with 30 plus years effectively maintaining accurate accounting information for large-scale Financial Organizations. Cooperated with engineering, manufacturing and corporate accounting to verify that quality standards were. Provided timely actuals, forecast, and budget data for IT and corporate management. 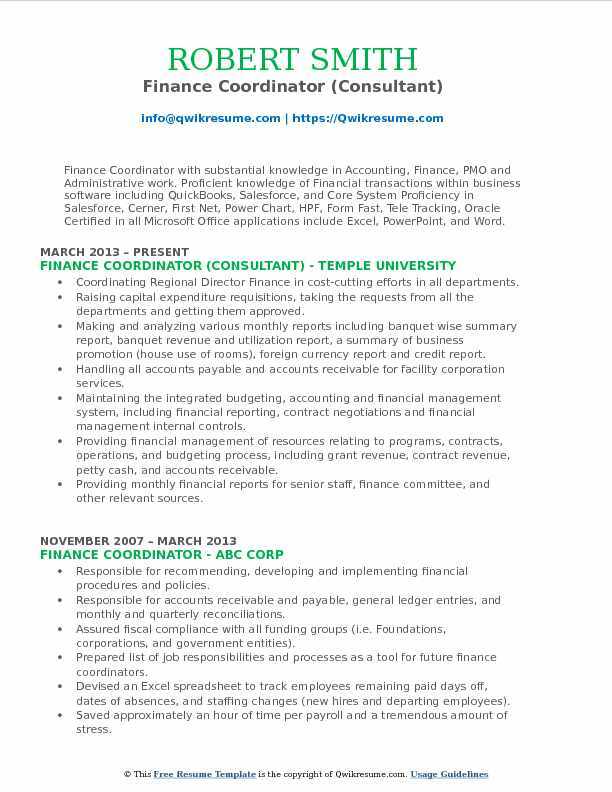 Summary : Seasoned Finance Coordinator with 10 years of experience and success in the fields of finance, technology, education, emergency management and disaster care with a solid managerial background. Dependable, flexible, and organized. Enjoy being in a team environment as well as providing leadership. Excellent customer relations history, supervisory background, communication skills, and computer software knowledge. Assisting in the facilitation of business loans to small businesses. Providing continuous support and leadership in areas of quality customer service and problem resolution for internal and external customers. Organizing and cultivating the inbound leads and making outbound calls to qualified candidates. Managing a pipeline of "leads" and follow up on the collection of necessary documents. Working closely with the underwriting team to ensure that loan contracts such as renewals or quotes are issued and changes are recorded correctly. Analyzing the of review new client applications and screening the applicant eligibility based on certain criteria. Cross-training new employees in department processes and equipment to ensure production competency. Organizing the weekly meetings with team to discuss and resolve issues, ensure calls and inquiries were processed expediently and identify suggestions for process improvement. Serving as document writer and technology liaison to maintain a strong working relationship between IT and sales team. Summary : Finance Coordinator with substantial knowledge in Accounting, Finance, PMO and Administrative work. 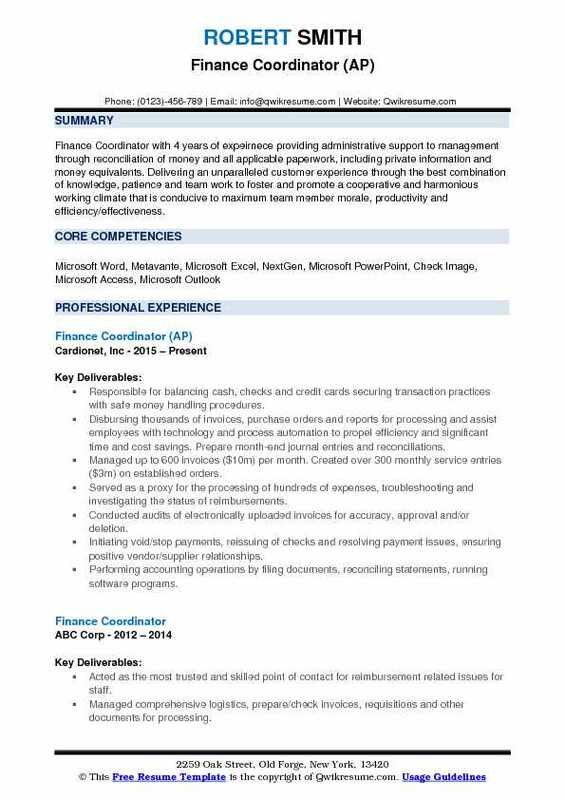 Proficient knowledge of Financial transactions within business software including QuickBooks, Salesforce, and Core System Proficiency in Salesforce, Cerner, First Net, Power Chart, HPF, Form Fast, Tele Tracking, Oracle Certified in all Microsoft Office applications include Excel, PowerPoint, and Word. Coordinating Regional Director Finance in cost-cutting efforts in all departments. Raising capital expenditure requisitions, taking the requests from all the departments and getting them approved. Making and analyzing various monthly reports including banquet wise summary report, banquet revenue and utilization report, a summary of business promotion (house use of rooms), foreign currency report and credit report. Handling all accounts payable and accounts receivable for facility corporation services. Maintaining the integrated budgeting, accounting and financial management system, including financial reporting, contract negotiations and financial management internal controls. Providing financial management of resources relating to programs, contracts, operations, and budgeting process, including grant revenue, contract revenue, petty cash, and accounts receivable. Providing monthly financial reports for senior staff, finance committee, and other relevant sources. Summary : Self-directed and detail-oriented Finance Coordinator with over ten years of extensive experience in invoicing and collections. Excellent organizational and problem-solving skills ensure a streamlined and efficient billing systems. Strong customer service attitude when dealing with internal and external customers. Proven ability to maintain precise records and proficient in a number of accounting applications. Committed to delivering high quality results with little supervision. Supporting multiple departments including; national promotions marketing, social media/console games, mobile apps, licensing, legal, finance, studio accounting, consumer products, and production. Responsible in SAP vendor setup/extensions, po requisitions, and goods receipt. Kept track of several hundred vendor contracts and processed reoccurring monthly contractor payments. Analyzing invoices for validity, milestone completion, account reconciliation and payment resolution. Working closely with sourcing, finance, legal, a/p, and external vendor to troubleshoot payment issues. Tracking budgets for multiple departments and meeting with the team on budget and project status update. Issuing the license film clip invoices through maestro and followed up on collections of outstanding accounts. Providing support during staff shortages and departmental reorganization. Processed over $20mm and tracked them according to project and business unit. Improved purchase order requisitioning by streamlining processes and reduce errors. 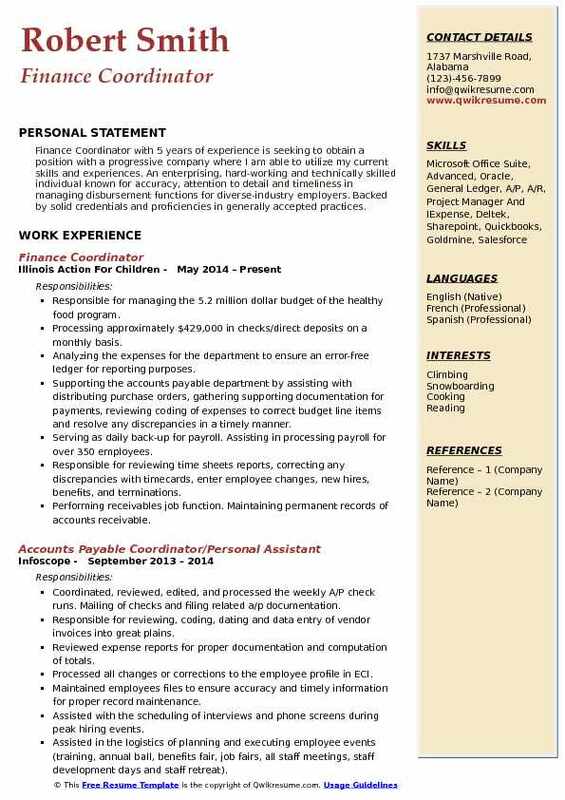 Headline : Finance Coordinator with 5 years of experience is seeking to obtain a position with a progressive company where I am able to utilize my current skills and experiences. 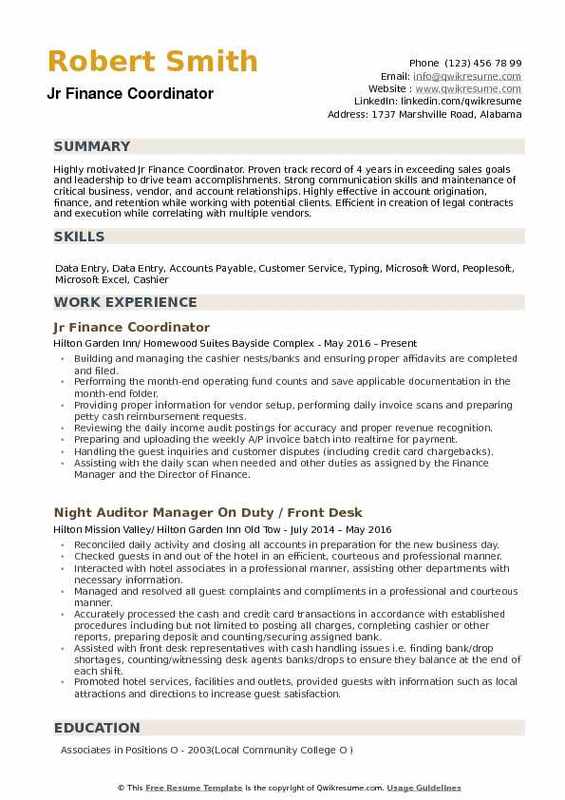 An enterprising, hard-working and technically skilled individual known for accuracy, attention to detail and timeliness in managing disbursement functions for diverse-industry employers. Backed by solid credentials and proficiencies in generally accepted practices. Responsible for managing the 5.2 million dollar budget of the healthy food program. Processing approximately $429,000 in checks/direct deposits on a monthly basis. Analyzing the expenses for the department to ensure an error-free ledger for reporting purposes. Supporting the accounts payable department by assisting with distributing purchase orders, gathering supporting documentation for payments, reviewing coding of expenses to correct budget line items and resolve any discrepancies in a timely manner. Serving as daily back-up for payroll. Assisting in processing payroll for over 350 employees. Responsible for reviewing time sheets reports, correcting any discrepancies with timecards, enter employee changes, new hires, benefits, and terminations. Performing receivables job function. Maintaining permanent records of accounts receivable. Processing the cash bank deposits. Assisting in coding and recording cash receipts to proper cost centers and/or revenue accounts. Updating and entering monthly personnel, dental and medical allocations according to the fiscal year budget. Objective : Highly motivated Jr Finance Coordinator. Proven track record of 4 years in exceeding sales goals and leadership to drive team accomplishments. Strong communication skills and maintenance of critical business, vendor, and account relationships. Highly effective in account origination, finance, and retention while working with potential clients. Efficient in creation of legal contracts and execution while correlating with multiple vendors. Building and managing the cashier nests/banks and ensuring proper affidavits are completed and filed. Performing the month-end operating fund counts and save applicable documentation in the month-end folder. Providing proper information for vendor setup, performing daily invoice scans and preparing petty cash reimbursement requests. Reviewing the daily income audit postings for accuracy and proper revenue recognition. Preparing and uploading the weekly A/P invoice batch into realtime for payment. Handling the guest inquiries and customer disputes (including credit card chargebacks). Assisting with the daily scan when needed and other duties as assigned by the Finance Manager and the Director of Finance. Reviewing our internal database to confirm that travel agent checks are being processed in a timely manner. Collecting and processing the contractor invoices for a previous week worked for payment.